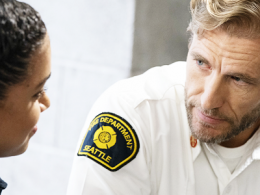 Barrett Doss is in the midst of filming Season 1 of the “Grey’s Anatomy” spinoff “Station 19,” which is executive produced by Shonda Rhimes, Betsy Beers, and creator/showrunner Stacy McKee, and premiered March 22. 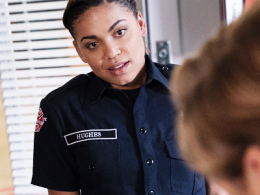 Fresh off a leading Broadway role as Rita Hanson in “Groundhog Day,” Doss makes a leap to television playing Victoria ‘Vic’ Hughes, a young firefighter at Seattle’s Station 19. 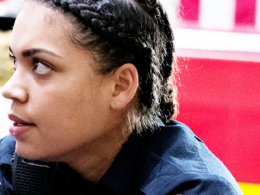 What has working on ‘Station 19′ added to your acting skills? There’s nothing like having practical fire gear to work with. When you have the helmet, the breathing apparatus, all of that stuff, it’s super demanding, physically. Getting to do something really physical and playing a firefighter, playing a character who has to put her own life on the line to save others, is something I’ve never done before. Did you have to change gears quickly to move from stage to screen? Not only do I think of it as a different skill that I’m still working on and building, but schedule-wise, it couldn’t be more different. When you do a Broadway show and it’s not a limited run and you don’t know when you’re going to close, it’s just “Well, this is my life” for however long. It’s exhausting and invigorating and so much fun, but when you’re doing a television show, you get weekends off most of the time but during the week, you’re on-call. You do your research. I like to take all of my cues from the writing. I like to read the scenes and get as much information as I can from what I have right there. How does she speak? What does she say in response to certain things? That’s how I build out my character. When we started the pilot, we had about a week of table work and rehearsal and practical training on a course that firefighters actually use, so that definitely informed some of the stuff that I knew I would be getting into with this role. Does that physical aspect help you get into character? You can almost guess that with firefighting comes a lot of compartmentalizing. You have to be able to shut down parts of your emotionality to be able to function. That’s an interesting challenge for an emotional breed of people. Actors tend to be pretty emotive—I certainly am. Have you ever used Backstage in the past? There was a time, when I first moved to New York, when I was reading Backstage a lot. I used the job search a couple of times, I definitely went to a couple of open calls when I was in high school. I finished high school in New York, and in the beginning of college I was working with an agent but I would still check out Backstage and look at breakdowns and email my agent: “Can I go in for this? Do you think I’d be right for this?” I still get my emails! I have worked with a couple of different agencies; I’ve been able to navigate through the New York side of the business for a long time now. I went to NYU at Tisch in the musical theater program, and that wasn’t a great fit for me, so I ended up finding my way into Gallatin, which is the school of individualized study, and building my own major. I use that as an analogy for how my career has gone. I think it’s important for young actors to try and do this your own way and not compromise their goals for any amount of fame. You have to pay a certain number of dues, but I think there are ways to make this business work for you instead of working for it. That’s something I learned from one of my teachers in college that I take everywhere: You’re never going to get past that part of the business where whether you get a job or not depends on someone else. It’s never really up to you, but give yourself the best chance. I wasn’t necessarily the right type, I thought, when I went in for Rita. I think in some ways because I owned that, it gave me a certain level of confidence. It is a business that you feel like you have to work for it in order to make it. I think it’s so easy to feel like a slave to it. I always found that when I would audition for things, it felt like I was the exception to the room, I would maybe be the only woman of color at a callback. And then it’s “Oh, am I the alternative option or am I actually being considered?” I hope the industry is changing in that respect, but there are ways to get past that if you try to create your own rules and create your own work. Yeah, you have to depend on other people for jobs most of the time, but there are also ways to build up that confidence and those coping skills to help you make it to the next one. I worked at this great coffee shop and I met one of my friends—to this day—when I worked there. I was also an assistant for a little while to a man who was blind. I did a lot of his typing and computer work and I was an all-purpose assistant. I would go with him to appointments, I helped him plan a huge trip. I only worked for him for a couple of months, but it was a really interesting experience just as an actor and as a human being. It was really great to have a little window into another person’s experience. And just being able to live in a place where you do encounter people from all walks of life likely equips you with a breadth of emotional material. That’s one of the things I love and I miss about New York. I’m really enjoying spending time in California, but in New York, you can’t avoid spending time with all sorts of different people. You’re constantly confronted with a whole host of different people and different people’s issues and different people’s personalities and the way they take up physical space. In California, you can stay fairly isolated in your little pod. You can go from your house to your car to your job to your car. That’s one of the reasons I love New York: you’re really exposed to everybody constantly. You’ve been working a lot lately between Broadway, and “Station 19.” How do you respond to people saying this is your “breakthrough” or that you’ve “made it”? I pride myself on being a really hard worker, and that happened during “Groundhog Day,” I’d meet people and they’d say, “Where did you come from?” I’ve been here! It just happens to be the right fit at the right time. There are so many people [for whom] I’m sure it’s been their experience, too. You work and you grind and finally there comes a job where you get some amount of recognition or an acknowledgement, but, really, that’s just accumulation of all of your hard work. I’m so inspired by Viola Davis, for example, who had a thriving career in theater before she hit it big on television and in movies. She’d been here—to act like she appeared out of nowhere and ignore the years and years of hard work that she put in to get there! Now I get the opportunity to show my work to a lot of people and to tell a lot of this story of my character and these firefighters, but it’s also just another job. I want to treat it like another job, otherwise you let it get to your head and you end up going totally nuts. But I am appreciative, because I have worked really hard for a long time. I’ve been working in New York since I was 16, so it’s nice to get a chance to show a broader audience what I can do.